For a certain generation of people, clay has become a conduit to romance thanks to a certain scene in “Ghost.” Patrick Swayze aside, clay is, and always has been, art. This blob of goo transforms into incredible figures, structures or practical pieces in the muddy hands of a skilled artist. And in unskilled hands it becomes a charming Father’s Day gift and pencil holder. Queen City Clay, located in Oakley, is one of the largest public ceramics studios and clay retail shops in the country. And they believes you’re more than just a pencil holder in a world of ornate vases, bowls and pitchers. Because really, it’s not the product that’s important to them. It’s the process. They foster the human impulse to create and believe that the shared experience of creating ideas and objects improves a person’s overall well being. That’s why they offer lessons, pottery painting and open wheel nights and private events. They can help teach you how to throw on a wheel and turn a chunk of clay into a perfectly-proportioned bowl or they can let you just go for it. Their influence extends beyond the studio, though. They play an important role in arts education in the community. They supply schools throughout the region with materials and training and they offer internships and an artist-in-residence program. And for even younger artists they offer classes and summer camps through the Art Workshop. You can catch up with Queen City Clay at Cincinnati Mini Maker Faire October 8 & 9 at the Hamilton County Fairgrounds. Purchase one of their masterpieces or try your own hand at ceramics. Hey, maybe your skills far surpass pencil holder. You never know until you get your hands dirty. For more information on Queen City Clay visit http://www.queencityclay.com. SNOT (Studs Not On Top). Just one club reference to the little dots on the top of LEGO bricks, and the mortar that holds together the incredible creations of the Ohio, Kentucky, Indiana LEGO Users Group (OKILUG), new Makers at this year’s Cincinnati Mini Maker Faire. Using nothing more than what comes in any regular LEGO kit – no glue, no color alterations, no special or cut pieces – OKILUG has built masterpieces using a toy that most of us grew up playing with and have grown old stepping on. But OKILUG skips the instructions sheets that come with their LEGO bricks. A pile of bricks to them isn’t an overwhelming mess or a sadistic parent torture device (watch your bare feet!). It’s a life-size bust of the Green Lantern. Or a city scene populated with your favorite cartoon and comic book characters. Or, well, anything. OKILUG members see a pile of possibilities, envisioning a world made of bricks as they start to piece together an architectural landmark. This year at Cincinnati Mini Maker Faire, they’ll be building a LEGO wonderland, brick-by-brick, complete with running trains and dotted with local landmarks like the Tyler Davidson fountain, free built to 1/50th scale with 21 minifigs and sand green bricks, plus a massive 1/50th scale Music Hall. You can also travel to a galaxy far, far away with their special Star Wars display and kick up the dust with desperadoes and outlaws in a Wild West display. For OKILUG, their imagination is a powerful tool, using bricks and plates to create whimsical masterpieces that’ll make you go home, climb into the attic and dig out your bin of LEGO bricks. Stop by and play along at Cincinnati Mini Maker Faire October 8 & 9. Then head home and see what you can build. Just be sure to wear shoes. LEGO bricks can be a harsh mistress. For more information about OKILUG and to see more of their creations, visit www.okilug.com or check out their Facebook page. A Wild West layout complete with desperadoes and outlaws. OKILUG members work to finish a giant Green Lantern minifig. With Cincinnati Mini Maker Faire just weeks away, Maker Mondays is our way of introducing you to some of the makers you can expect to see at this year’s event. For 58 years, GBBN Architects has been able to see things no one else can. They can see beyond existing walls and structures to visualize something different, something better, like they did when they transformed the Aronoff Center for the Arts. They can see an empty lot and visualize a baseball stadium with 42,000 cheering fans, like they did when they designed Great American Ballpark. They can see a hospital and visualize a center that can change the lives of families from across the country, like they did at Cincinnati Children’s Hospital Medical Center. GBBN most recently looked at Union Terminal and saw beyond the limestone and brick façade of a national historic landmark to see the steel structure underneath. Working with Truescan3D, they collected over 2 terabytes of data and used 4.3 billion data points to create a 3D model of Union Terminal, both inside and outside, as well as the dizzying steel skeleton in between. GBBN and Turner Construction Company will use those scans to guide them through the 2 ½ year restoration of Union Terminal. Take a quick 3D tour of Union Terminal here. As Cincinnati Mini Maker Faire first timers, GBBN is excited to share their work with the community in a new way and with a new perspective. Several of their designers and architects will be on hand to share the technology and tools they use to transform communities. They’ll show interactive videos of their 3D scans and will even have a 3D printer on hand to print some examples of their work. You can learn more about GBBN Architects at their website www.gbbn.com or meet them yourself at Cincinnati Mini Maker Faire October 8 & 9 at the Hamilton County Fairgrounds. Visit www.cincinnatimakerfaire.com for more details. Cincinnati Mini Maker Faire 2016! Cincinnati Mini Maker Faire is back October 8 & 9! Cincinnati Museum Center’s Cincinnati Mini Maker Faire is back for its 4th year and this year promises to be bigger, better and more explosive than ever. Due to the historic restoration of Union Terminal, 2016’s Cincinnati Mini Maker Faire will be sprawling across the Hamilton County Fairgrounds. Annual favorites like the Manufactory, R2-D2 Builders Club and HIVE13 are back and will be joined by thrilling newcomers like the Ohio, Kentucky, Indiana LEGO Users Group (OKILUG), the 501st Legion and many more, including your inventions, gadgets, creations and skills. Cincinnati Museum Center is now accepting applications for all interested Makers and vendors, so fill yours out so you can help make the 2016 Cincinnati Mini Maker Faire the best and most explosive yet. Fill out your application via the online form. Follow us on Facebook, Twitter and Instagram for Maker stories, bios and more information. Saturday’s Ping Pong Ball Explosion. Photo by Cary Lin. We had a blast at the third annual Cincinnati Mini Maker Faire, and we hope you did too! Thanks to our makers, vendors, performers, sponsors and visitors for making the weekend explode with fun. Check out more photos made by our intrepid photo intern Cary Lin here! EepyBird’s Coke & Mentos Spectacular was epic! Shop the Cincinnati Mini Maker Market! Paper Acorn at Cincinnati Mini Maker Faire 2014. Photo by Ziegelmeyer Creative. Like unique crafts, one-of-a-kind creations and shopping local? Bring your reusable shopping bags to the Cincinnati Mini Maker Market in Cincinnati Museum Center’s Rotunda during this weekend’s Cincinnati Mini Maker Faire! Market hours are 10 a.m.-5 p.m. Saturday, Aug. 29 and 11 a.m.-6 p.m. Sunday, Aug. 30. And you’ll want to arrive early: If you’re one of first 100 people to provide your email address at Museum Center’s booth in the Rotunda, you’ll get a free 18×24-inch commemorative Cincinnati Mini Maker Faire 2015 poster and be entered into a raffle to win a Maker basket filled with goodies! Learn more about all of our vendors here. Admission to the Cincinnati Mini Maker Market is free, but you’ll need a Cincinnati Museum Center Membership or an All Museums Pass to explore the rest of Maker Faire. Buy in advance online to save! Preston will perform the violin with two amps to give stereo effect and enhance the experience of the listener hearing what seems like two violins playing in rhythm with one another, when in actuality there is one violin and a loop pedal. He’ll have free pins and info about music in general and Make It Happen Music. Katie is a singer/songwriter hailing from Glasgow, Kentucky. She plays Celtic folk harp and sometimes acoustic guitar. She plays a wide variety of music from covers of modern pop songs, to ancient ballads, to original music. She also composes and performs for the geek crowd, and once even wrote a song specifically for the Maker movement. See science explode into action with liquid nitrogen and 1,500 ping pong balls! What happens when liquid nitrogen boils in a tightly capped bottle? At over 160 pounds per square inch, our bottle suffers a catastrophic failure, releasing over 25,000 pounds of force and launching our 1,500 ping pong balls over 100 feet into the air. EepyBird’s live show from Maker Faire Detroit. Photo by Gary Malerba. Watch EepyBird’s Fritz Grobe and Stephen Voltz don their lab coats and drop 540 Mentos mints into 108 two-liter bottles of Coke Zero, creating geysers of soda that will erupt over 25 feet into the air. Representatives from local breweries including Taft’s Ale House, Christian Moerlein and Rivertown will be speaking on the unique characteristics of their beers and breweries and answering audience questions. Watch and listen as music creates a constantly changing display of fire! Admission to all of the indoor performances and the rest of Cincinnati Mini Maker Faire is free for Cincinnati Museum Center Members or included with an All Museums Pass. Buy in advance online to save! All aboard the Maker Train! Now that Cincinnati Mini Maker Faire calls a historic train station home, we thought it was only fitting that we bring out our riding train for our mini Maker Faire guests. And in true Maker Faire style, this train ride will take you on a trip through a robot junkyard! Because we at Cincinnati Museum Center are all about reducing, reusing and recycling whenever we can, our exhibits staff decided to give life to antique audio-visual equipment, cardboard boxes, paper towel tubes and leftover parts of old exhibits and displays by reincarnating them into robots, just in time for Maker Faire. Check out this photo gallery for a sneak peek of the bots you’ll meet this weekend. Head down to the South Gallery of the Cincinnati History Museum between 10 a.m. and 5 p.m. Saturday, Aug. 29 and 11 a.m. and 6 p.m. Sunday, Aug. 30 to take a trip on the Maker Train for just $1 per ride. Sorry, tall train enthusiasts: You must be no more than 52 inches tall for this thrill ride. But there’s plenty more to see and do this weekend for makers of all ages, so get your tickets now! Never been to Cincinnati Mini Maker Faire before? No worries, here’s a guide to help you fit right in when Maker Faire returns to Cincinnati Museum Center on Aug. 29 and 30. Or stand right out, if that’s your thing! 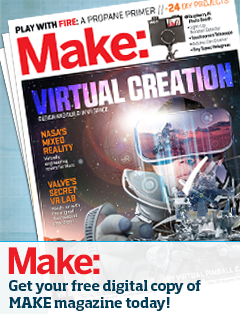 You’re going to a Maker Faire to see and experience creativity on display. But that doesn’t mean you can’t express your own creativity as well. This is a great opportunity to let your inner child/geek/steampunk out! Maker Faires are a celebration of expression and invention, and a safe place to be yourself or be someone else. So break out a costume, or some goggles or at least a fun tie. You’ll definitely need your All Museums Pass (cheaper if you buy in advance online!) or a way to pay for your Cincinnati Museum Center tickets. At Maker Faires, it’s also a good idea to have a little cash in case a vendor is not equipped to take credit cards or you wish to donate to a maker’s supply fund. If the forecast calls for rain, be sure to bring an umbrella as there are always lots of fun things to do outside, such as power tool drag racing. Oh, and if you have children, bring them along, too. But no dogs. Except maybe robot dogs. The key to enjoying a Maker Faire is to be completely open-minded. You never know what you will find around the next corner. The event is kind of a cross between a science fair, art exhibit, comic convention and carnival. This is the place where passions are on full display. You won’t see sales pitches and business models – for these makers, invention, expression and exploration are their own reward. For you, walking through Cincinnati Museum Center will be a unique Cincinnati adventure! Participate. Be curious. Ask questions. Have fun, learn and get inspired! And remember to take the time to snap some photos and videos and share them using the #CityofMakers hash tag. Since our inaugural Faire in 2013, Cincinnati Mini Maker Faire has brought together an amazing assortment of makers. We really hope you enjoy your first time, and are inspired to be a part of Maker Faires in years to come. You might know about EepyBird’s extreme Coke and Mentos experiments from their viral videos, The Late Show with David Letterman, Ellen, the Today Show and Mythbusters, to name just a few. And next Saturday, you can catch them live at Cincinnati Mini Maker Faire at Cincinnati Museum Center! EepyBird will present their renowned Coke & Mentos geyser performance, “The EepyBird Coke Zero & Mentos Spectacular,” at 1 p.m. Saturday, Aug. 29 in Museum Center’s North Parking Lot. The performance is a live version of EepyBird’s famous “Extreme Diet Coke & Mentos Experiments.” But this show will be even bigger: When Fritz Grobe and Stephen Voltz don their lab coats and drop 540 Mentos mints into 108 two-liter bottles of Coke Zero, geysers of soda will erupt over 25 feet into the air. They call it “an unbelievable candy-powered version of the Bellagio fountains in Las Vegas.” We call that something you won’t want to miss! Admission to Maker Faire is free for Museum Center Members. Not a Member? Join today or buy an All Museums Pass in advance online to save and to make the most of your Maker Faire experience! Cincinnati Mini Maker Faire is independently organized and operated under license from Maker Media, Inc.